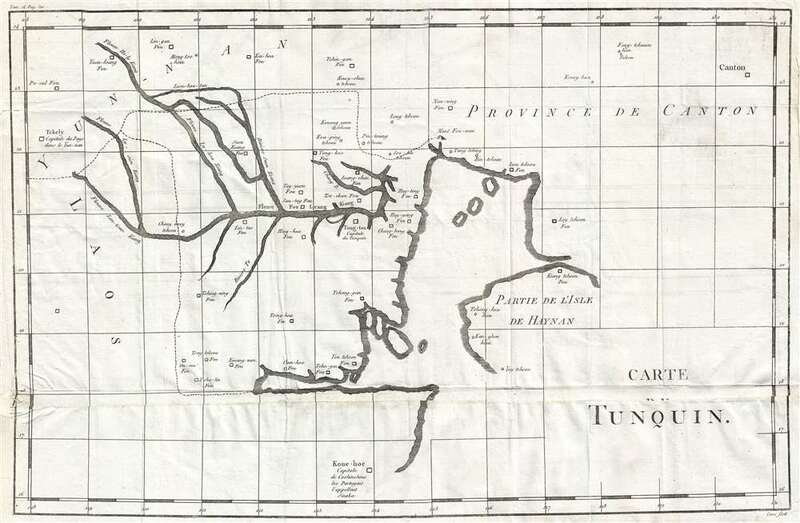 A very unsual 1781 map of northern Vietnam compiled from early Jesuit missionary reports. This unusual maps covers from Canton (Guangzhou, China) in the far northeast southwards as far as Koue-hoe (Hue, Vietnam, ancient capital of Cochinchine), and westwards as far as Tchely (Kunming, Yunna, China). The map includes part of Hainan Island, Ha Long Bay, the South China Sea, and various rivers systems leading into the mountainous interior of modern day Vietnam. Tong-Tou, most likely the modern city of Hanoi, is noted. Numerous cities, villages, and ethnic groups are noted, as are the borders the Kingdom of Tonkin. The map was engraved by Jean Dominique Etienne Canu in Paris, France, for issue in Yves Mathurin Marie Treaudet de Querboeuf's Lettres Edifiantes et Curieuses. Jean Dominique Etienne Canu (1768 - 1843) was a French engraver active in Paris from about 1780 to 1816. Canu's work mostly focused on fashion plates, portraiture, architecture, and natural history. Canu studied under Delaunay, another French engraver. Little is known of his life and the date of his death remains obscure. His cartographic corpus is minimal. Le Gobien, C., and Treaudet de Querbeuf, Y. M. M., Lettres edifiantes et curieuses: ecrites des missions etrangeres, (Paris) 1781. Good. Map is in generally good condition, however, the lower quarter of the map seems to have been cut off and reattached to itself, but poorly. This is an issue we have seen with other examples form this series and believe it may have resulted form an effort of the original binder to fit the map more easily within the book.